For over 55 years Cottman Glass & Mirror Company has been servicing the Philadelphia and suburban communities by providing expert design and installation services covering a wide range of decorative solutions for home and business. Our product lines are extensive and cutting edge. We offer the latest in frameless glass shower enclosures, textured and decorative glass products, beveled and antique mirrors, wardrobe doors, glass furniture tops and more. Although much of our product line is supplied domestically, we also bring in specialty products from Italy for that perfect blend of old world sophistication and modern comfort. These enclosures can also be customized by choosing a variety of glass textures and metal finishes such as polished chrome, brushed nickel, oil-rubbed bronze, antique and matte black and many others. Everyone's style, budget and space is different, making each client unique. 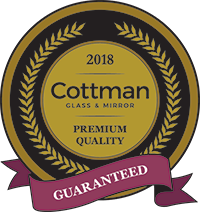 Cottman Glass & Mirror Company is here to serve everybody. Our customers come from all over PA, NJ and DE. We are a full service company that offers fabrication of in-shop orders, in-home design consultations, delivery, and expert on-site installation. Our product lines such as Shower Guard protective finish for shower and tub enclosures and Portals Hardware, come with a limited lifetime warranty.